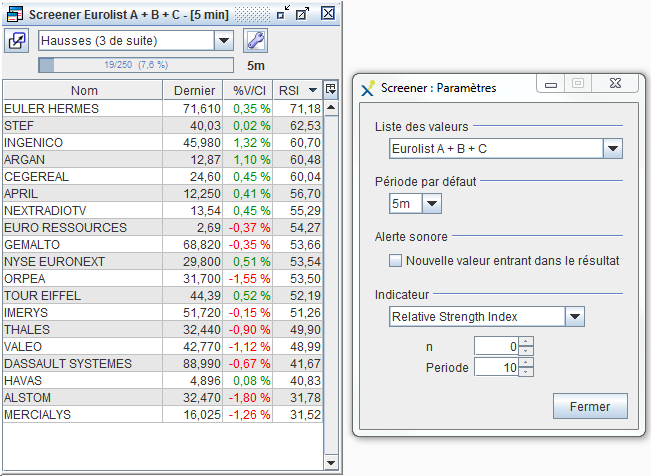 Up to 10 Watch Lists, each with a maximum of 1500 stocks (equities, futures, indices, Forex, ...) with auto-sorting capability on the chosen column. Up to 10 real-time Market Screeners, each with a maximum of 1500 stocks, to detect every seconds thoses stocks meeting the user's selection criteria. 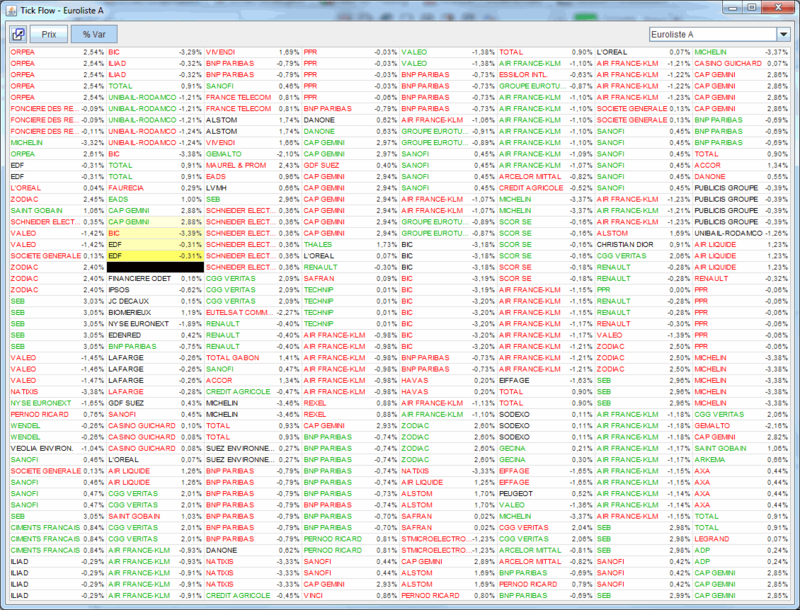 Up to 10 real-time Winner/Loser Rankers, each with a maximum of 1500 stocks. The Winner/Loser Ranker classifies every seconds the listed stocks according to their price variations over a selected period of times in minutes, hours, days, weeks or months. 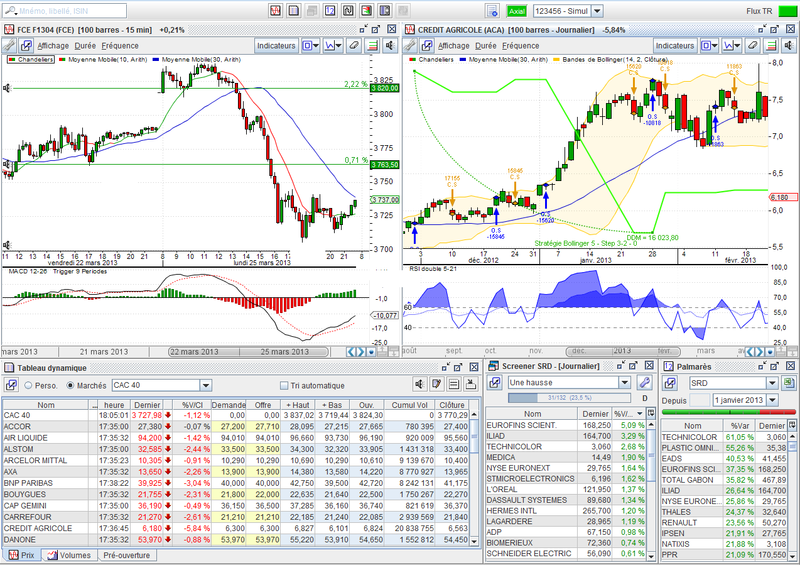 A hundred of customizable technical indicators are available in the Live Charts for graphical and technical analysis. These charts offer the same facilities as in Axial Finance Expert. 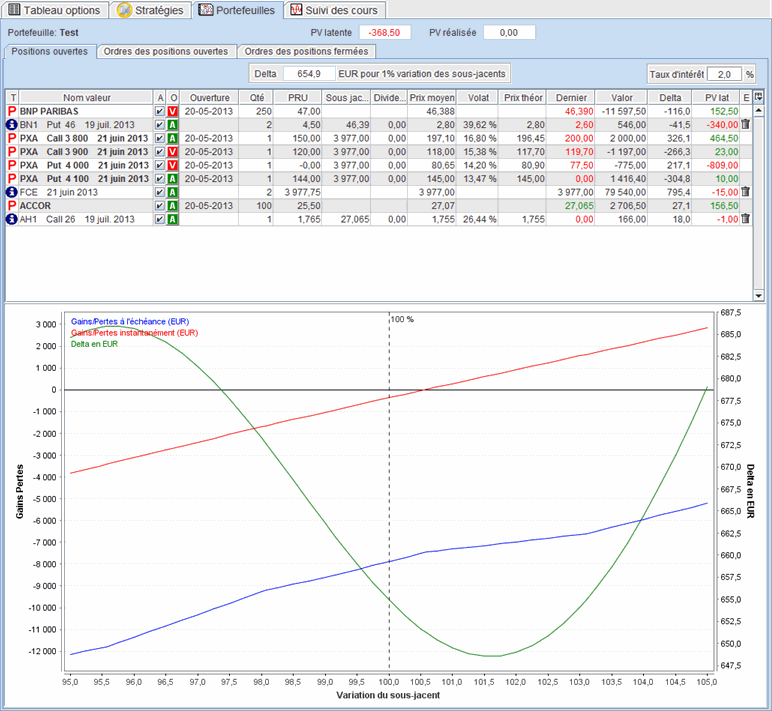 For an underlying and maturity selected, Axial Finance Global Trader calculates and displays in real-time in a global table all CALL and PUT options classified by increasing strikes with the implied volatility and the Greek parameters (Delta, Gamma, Theta, Vega and Rho) options. The options in the money and out of the money are distinguished by a different background color: green and red respectively for CALL and PUT in the the money, gray for options out of the money. Identification of options meeting for instance a percentage of implied volatility is immediate, as well as reading the last quoted price and the best offer and demand prices. The dividend and interest rates can be set up and applied to all listed options. Settlement prices are also part of the data displayed. The calculation of the price of an option can be done independently in a window Pricer simply opened by clicking on the name of the option. At the opening of a Pricer window, the data fields are set up with relevant values known at this time. 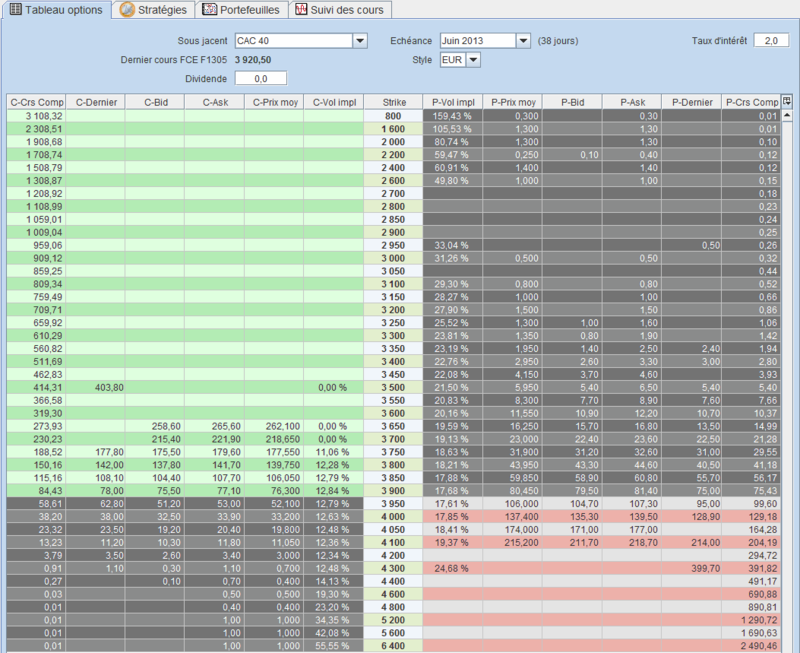 Afterwards, the user can change these data : strike, underlying, time to maturity, implied volatility, dividend and interest rates. 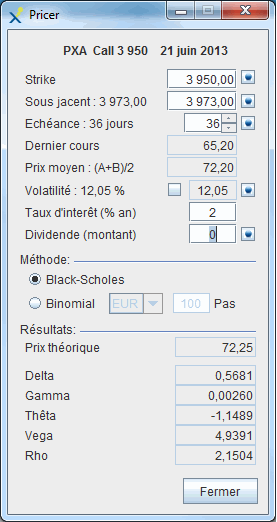 The recalculation of the option price is automatic at each change of any data, according to two calculation models : Black-Scholes or binomial. 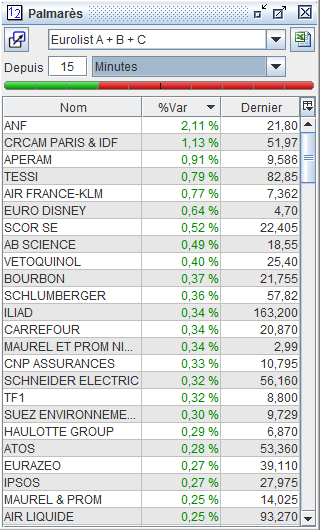 There is no limit to the number of Pricer windows opened simultaneously. The search for the best strategy relative to an underlying is an essential function. This research is carried out either with the current prices updated in real time, either by simulation with specific data set up by the user. 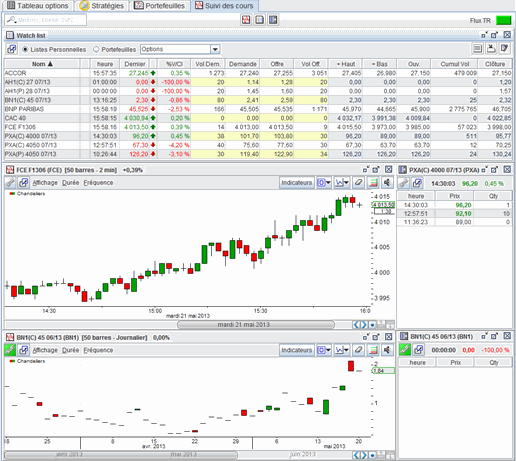 The man-machine interface of Axial Finance Global Trader was especially designed to facilitate the research : adding options in the strategy by drag and drop from the global list, easiness to change important parameters like sense of order (Buy or Sell), number of items, premium, underlying price, time to maturity, implied volatility and dividends. The result of the strategy is presented in a graph with the price of the underlying as x-scale. It shows the evolution of profits and losses at maturity, profits and losses at the current moment and the Greek parameters (Delta, Gamma, Thetra Vega and Rho). 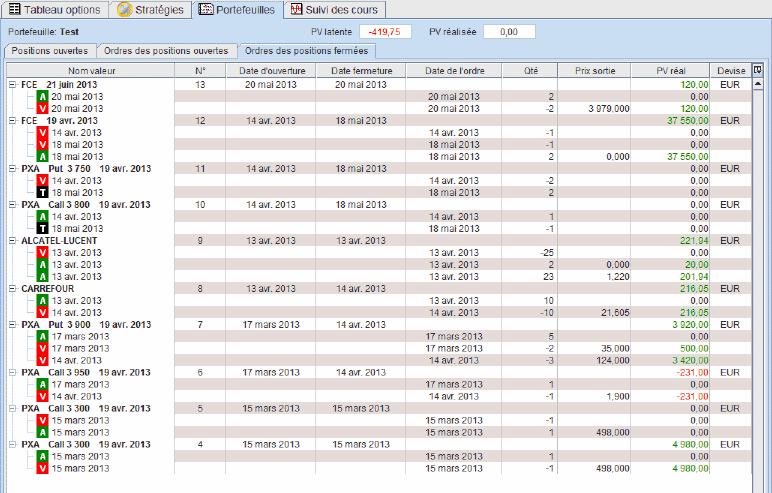 The cost of the strategy based on the premiums paid and the number of options is indicated. 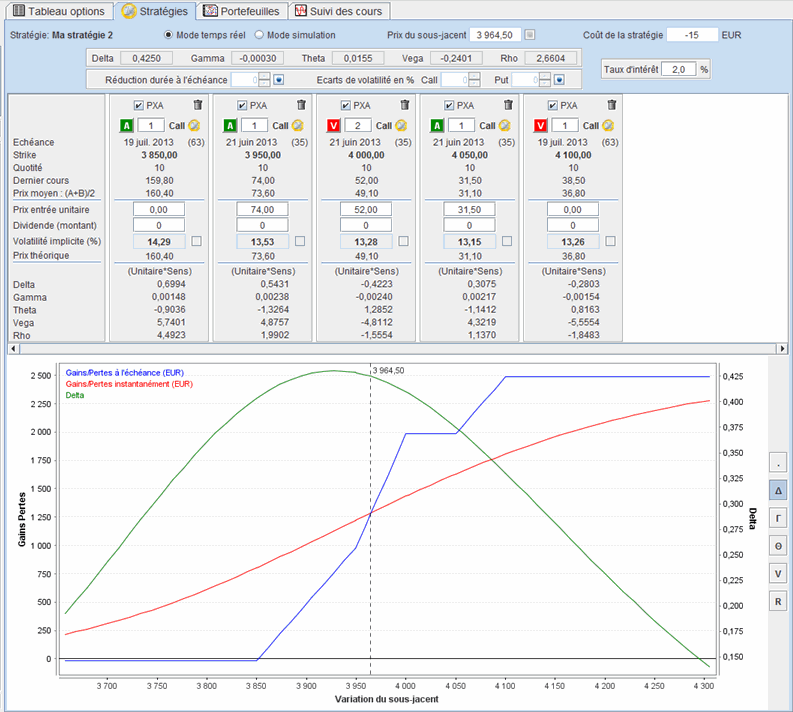 The selection of the simulation operating mode will stop price updating in the real-time and will allow to focus on the consequences of a specific change in the underlying price, the reduction of the term to maturity, the change of the dividend or the variation of implied volatilities. Tickflow is a totally innovative tool for real-time detection of stocks that suddenly experience a great number of trades which signals the beginning of a strong move upward or downward. All trades relative to a list of stocks are shown in synthetic form in a table with configurable dimensions to visually highlight those stocks that suddenly are experiencing a high volume of trades. The analysis of a portfolio is different from the search for the best strategy as above due to the fact that a portfolio contains options with multiple underlying stocks not necessarily correlated with options. Axial Finance Global Trader distinguishes in the portfolio the positions relative to orders transmitted to the market and those positions referred to as temporary positions that are temporarily present in the portfolio for analysis but whose orders have not yet been transmitted for execution. The status of the portfolio calculated in real-time is also presented in graphical form with a x-scale based on the variations of the underlyings prices, variations taken into account as a percentage of changes with respect to the current price of each underlying. The potential profit is displayed in real time for the portfolio and each position individually. 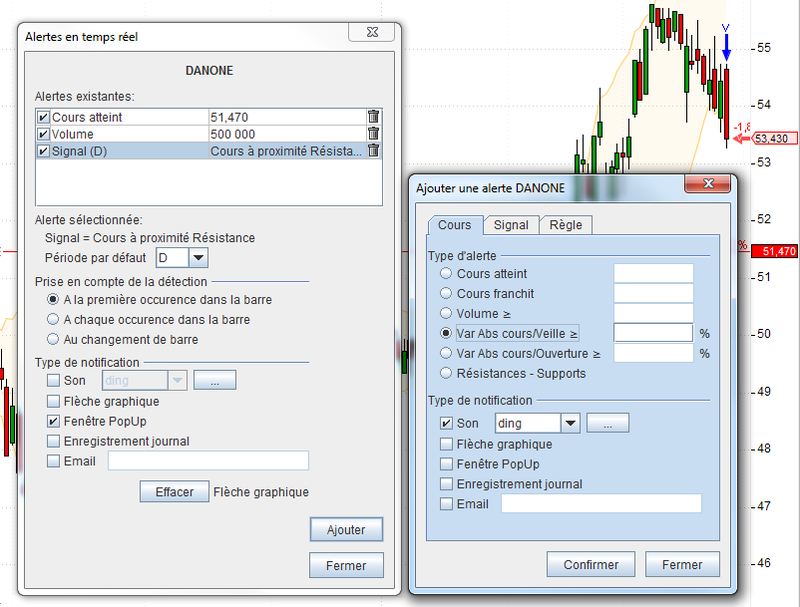 Knowledge of the portfolio Delta is an important factor in the analysis. It is calculated and displayed as a monetary amount given the different underlying stocks in the portfolio and not in percent as in a strategy based on a single underlying. The management of a portfolio based on Delta-neutral is a classical method whose implementation is not easy when the portfolio contains numerous positions with multiple underlying stocks. The method of determining the Delta adopted by Axial Finance Global Trader provides a precise and immediate knowledge of its value with the most complex portfolios. The man-machien interface implemented in the portfolio makes it easy to temporarily change any parameter of each position to determine the effect on the value of the Delta, value calculated as a monetary amount as described in the above point. Each order of a particular position gives the following details: date of the order, direction, quantity, cost, amount, potential profit and the realized profit.